Named for the type of stone used to create this water feature, this Manabi Water Wall creates a beautiful, captivating wall piece. With the use of varying Manabi stones of different textures and size, this water feature offers a natural complex of depths, textures, and creativity to any wall space. As light shines upon the piece, this water feature can't help but gather attention. Awaiting customization, this specific piece included the bronzed bird of paradise as an incorporation of the client's logo. 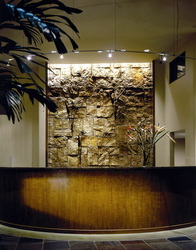 This water wall can feature your logo as a focal point unlike anything else.